At first read, Diane A. S. Stuckart’s new book Fool’s Moon is a questionable read, with most of the story written from a cat’s point of view. But as the story moves forward, the reader gets a good chuckle and finds it easy to turn the pages. Any good pet owner will find the opening difficult, when Ophelia and Brandon, two black cats, brother and sister, are unceremoniously boxed up and discarded along the roadside by the son of their recently deceased owner. Brandon escapes and attempts to learn what happened, but he does not return. Ophelia finds herself adopted from the animal shelter where she is rescued. Her new mom is Ruby, a tarot card reader of questionable skill, who has a soft spot for wayward animals. Ophelia makes friends with Zuki—an abused pit bull, and they plot to find Brandon. In the meantime, Luciana, a Cuban housekeeper visits Ruby to have her cards read and get an answer to her question: Was her employer murdered by her son? Lo and behold, the dead employer was also Ophelia and Brandon’s deceased owner. Given this turn or events, Ophelia is even more determined to find Brandon, and with Zuki, she accomplishes her goal. But it’s not a happy ending just yet. Three street dogs led by Rally, a feisty terrier, do not make it easy to rescue Brandon and Stuckart designs a good, tense scene to make this happen. They all return to Ruby who easily accepts Brandon into the house. Then Luciana is killed by a hit and run driver, and Brandon’s recent owner, Luis, also turns out to be Luciana’s nephew. When he learns of Brandon’s presence with Ruby and demands Ruby return the cat, the question about Luciana’s death gets darker. The spiderweb tightens as Ophelia and Brandon and Zuki search for clues in two deaths: Grace Givens, their previous owner, and now Luciana, the housekeeper. Suspects rise from the dust: Luis, Luciana’s nephew; Terry Givens, Grace’s son; and Joan, Terry’s girlfriend. 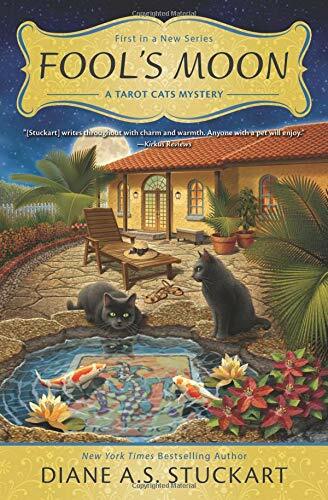 Stuckart does a good job of laying out the story with clues, red herrings, suspects, and let's not forget the animals: a prophetic, poetic koi; three crazy roosters; a protective pit bull; and two tarot card reading cats. Fool’s Moon is a fun read, and it would appear that this is just the beginning of more adventures. And remember that tough little street terrier, Rally? Don’t be too surprised to see him in a future story.